It is a patently problematic issue. Agriculture biotech giant Monsanto’s genetically modified cotton seeds are not patentable because India’s Patents Act prohibits the patenting of plants and bio-logical matter, a division bench of the Delhi High Court ruled on April 11 in the long-running case between Monsanto and its licensee Nuziveedu Seeds (NSL). As such, the US agriculture biotech’s Bollgard-II Bt cotton seed technology, which is designed to resist the bollworm pest, cannot be enforced in the country. This means NSL and the dozens of other Monsanto licensees are free to use and sell the technology without being in violation of the many patents that Monsanto had been granted in 2008 in India. The high court bench of Justice Ravindra Bhat and Yogesh Khanna set aside Patent 214436 titled “Methods for transforming plants to express bacillus thuringiensis delta endotoxins”. Bollgard-II seeds have stacked genes (Cry1Ac and Cry2Ab) extracted from the soil bacterium bacillus thurin-giensis—hence the name Bt cotton—which is said to protect the plant against three pests: American bollworm, pink bollworm and spotted bollworm. The first generation hybrid seeds, or Bollgard as Monsanto calls it, contained only the Cry1Ac gene. The bench cited Section 3(j) of the Patents Act which does not allow the patenting of plants to overturn the patent. Specifically, it bars patenting “plants and animals in whole or any part thereof other than micro-organisms but including seeds, varieties and species and essentially biological processes for production or propagation of plants and animals”. As a result, the patent held by Monsanto, through its Indian arm Mahyco-Monsanto Biotech Ltd (MMBL) on Bollgard-II technology, is not enforceable in India, the court ruled. Any royalties on the technology will be decided by the Union Ministry of Agriculture. However, MMBL has been permitted to approach the Protection of Plant Varieties and Farmers’ Rights Authority (PPVFRA) for registering the Bt plants within three months, after which the Authority would decide on a benefit-sharing mechanism. Tragically, the verdict comes as cotton farmers are finding Bollgard-II increasingly useless against the pink bollworm which is ravaging cotton fields across the country. Over 90 per cent of the 12.2 million hectares under cotton is covered by Bt cotton hybrids, primarily Bollgard-II. The patents expire in 2019, that is, 20 years after the date of filing, November 1999. The greater tragedy is that public sector in India is promising a solution to the deadly cotton pest through a variant of the same Bt technology. The apex research organisation, the Central Institute of Cotton Research (CICR), Nagpur, announced a couple of years ago that its Bt cotton would be in the market in 2017; but according to latest reports, the products are still in the pipeline. Cotton farmers are thus caught in a technological vice which closed in on them in 2002 when the then National Democratic Alliance government of Atal Bihari Vajpayee regularised the illegal cultivation of Bt cotton with Monsanto’s Bollgard which had not been subjected to the regular processes of approval. No large-scale field trials had been conducted when the illegal cultivation started in Gujarat. The state government, it was said, had turned a Nelson’s eye on it because it did not want to stop the farmers from accessing the latest technology. Since then states have been using various means to bring down the trait fees or royalty charged by Monsanto. Initially, Monsanto had levied a predatory trait value amounting to two-thirds of the cost of a packet of seed till the then Andhra Pradesh government of Rajashekhara Reddy used the Monopolies and Restrictive Trade Practices Act, the courts and the Essential Commodities Act to cut the fee. He was followed by a clutch of other states which also went to the court to make Monsanto less rapacious. The genesis of the current legal wrangle is a dispute between NSL, the largest hybrid seed company in the country, and Monsanto over changes in the licensing agreement and a further reduction in trait fees. In 2015, Prabhakara Rao, Chairperson and Managing Director of NSL, sought a 10 per cent cut in royalties or trait fees levied by MMBL. It was a demand which was joined by other seed firms which said it was impossible to pay the fee demanded by Monsanto because some states had fixed the total seed price. As the stand-off deepened, MMBL terminated its agreement with NSL which is said to have owed it R140 crore. Rao, who was also the head of the National Seeds Association of India, then sought the support of the Rashtriya Swayamsevak Sangh (RSS), the inspirational force of the ruling Bharatiya Janata Party. A leading RSS outfit, the Swadeshi Jagran Manch (SJM), is opposed to multinationals and campaigns to promote indigenous products and technology. NSL was also backed by the Union Ministry of Agriculture which is headed by Radha Mohan Singh, a lifelong RSS member and a steadfast opponent of GM crops ever since he was agriculture minister of Madhya Pradesh. He introduced additional price controls that cut Monsanto down to size, reducing its profits by 16 per cent. MMBL then sued Nuziveedu Seeds and its subsidiaries for continuing to sell seeds using its patented technology despite termination of its sublicence agreement. Nuziveedu then filed a counter suit challenging Monsanto’s patent. Although Monsanto has not acted on its 2016 decision to pull out of India, there is uncertainty over the company’s future. The question is whether there will be a Monsanto a few months down the line since it has been acquired by the German agrochemicals giant Bayer for US $66 billion. Both the European Union and the US have given the green signal to the acquisition, but India’s Competition Commission is examining the implications of the merger, which will result in a commercial behemoth with more monopoly power. For cotton farmers though this might be of little interest as they wage a struggle with the bollworm, specially in Maharashtra, Madhya Pradesh, Telangana and Gujarat. The Centre cannot escape responsibility for the calamity since it was aware of the massive bollworms attacks that resurfaced in November 2015. It was clear then that Bollgard-II was ineffective since the pest had built up resistance. Monsanto’s answer is a herbicide tolerant Bollgard which is yet to be approved by regulators. However, illegal planting of this crop is taking place in several states. 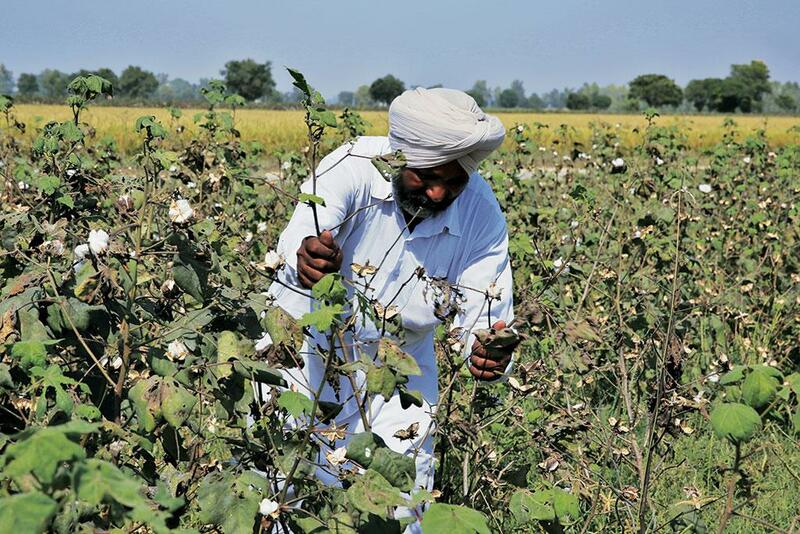 India has come full circle on its BT cotton tangle. (This article was first published in the 16-31st May issue of Down To Earth under the headline 'The Bt cotton fiasco').